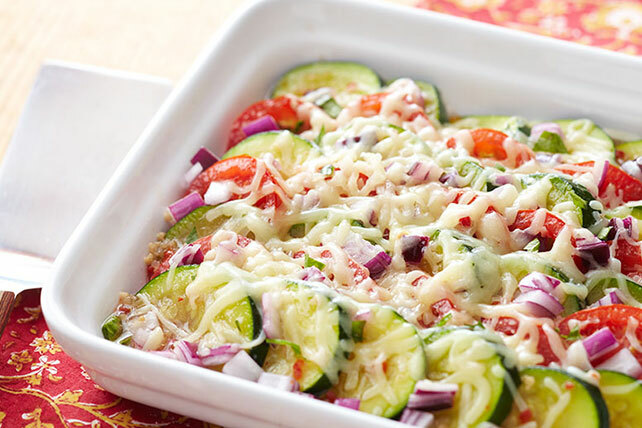 Try a glorious farmers' market Zucchini Gratin! This Zucchini Gratin is perfect for zucchini lovers—and for lovers of plum tomatoes, cheese & fresh basil. Arrange 4 rows of zucchini alternately with 3 rows of tomatoes on bottom of 9-inch square baking dish sprayed with cooking spray, overlapping rows as necessary. Sprinkle with onions; drizzle with dressing. Cover. Bake 30 to 35 min. or until zucchini is tender, uncovering after 20 min. Top with basil and cheese; bake 5 min. or until cheese is melted. Add extra color by preparing with a mixture of green zucchini and yellow summer squash.